Tabletop holding individual blooms classified by name and year of naming. 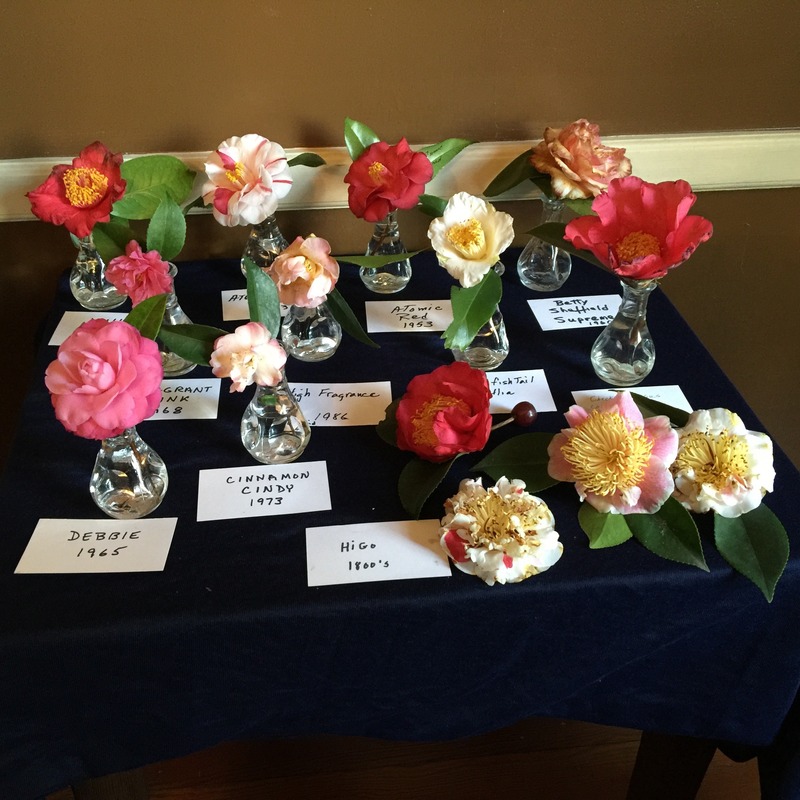 The Edgefield Camellia Club held its annual tea on Friday, February 11, on a day that was sunny and a bit warmer than had been earlier in the week. In the last several years predicting how the weather will be for the camellias has not been easy. This year enough blooms escaped the freezing night temperatures to bring color and design to the special event that is a revival of a tradition in the 1950s, the Camellia Tea. Magnolia Dale, the Historical Society’s house museum, is illuminated with color and the reflections of glassware and silver serving pieces on this day. Club members add their individual party food contributions as well as decorating skills to make the event one of beauty and fine flavors. Each tabletop of furniture held lines of individual blooms classified by name and year of naming. This bit of academia is a part of the beauty of such an event – a learning experience for those wishing so, an opportunity to know what is cultivated in this area. More and more the Tea is attracting guests from outside out county. However, it is especially heartwarming to the Club when local leaders show their support. Among those leaders this year was the new Superintendent Robert Maddox. His in-laws from North Augusta were there as were numerous guests from far and wide.